It’s back! 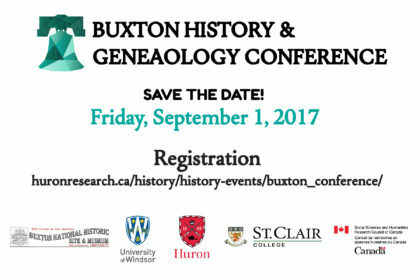 The Buxton History and Genealogy Conference returns on September 1st, as part of the Buxton National Historic Site and Museum Labour Day Homecoming weekend. The 2017 conference is supported by the University of Windsor, St.Clair College, Huron University College and the SSHRC-funded Black Press in Canada project. Registration is open HERE.